If the shoe fits, eat it! When Father Erik Lundgren woke up on the morning of October 7th, he laced up his running shoes and headed up the Twin Cities Marathon. This day was special.. not only because it was his first marathon, it was also his birthday.. and not just any birthday, his 30th. Running races are a great way to do something healthy, while others get to support you! In fact, so many ‘others’ supported Fr Erik in this run that he was able to raise well over $20,000 for our local Catholic Elementary School, Divine Mercy Catholic School. Talk about a good cause! To celebrate, we gathered with Fr Erik after the 5pm mass to enjoy cake from Confectionery Cake Shop and Ice Cream from Sweet Spot Candies! 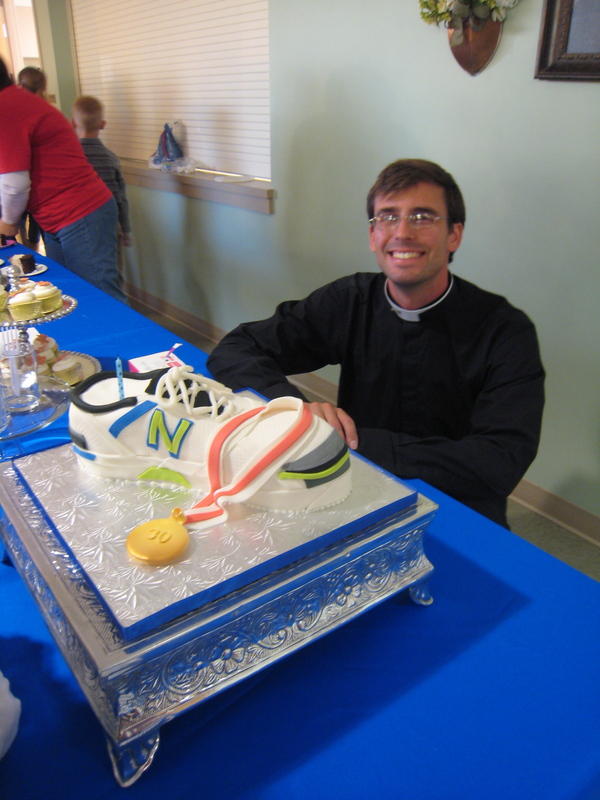 He received his very own cake, which was a replica of the shoe that he ran the marathon with.. and an edible gold medal for finishing the race, draped across it. Over 150 folks shared in his excitement and enjoyed a raspberry filled white cupcake or a slice of tuxedo cake with fresh raspberry filling. Turning 30 is just the beginning, Fr Erik! Enjoy!